This is a story about the digital transformation of Contoso HVAC Manufacturing, a virtual company that is growing its business from a traditional HVAC Chillers manufacturer, to delivering value to customers as a service. Contoso HVAC understands that the Internet of Things is a key ingredient to this transformation, but rapidly realizes that there is no such thing as a one-size-fits-all IoT solution. Each industry, each company have their own constraints and requirements. Each are trying to navigate and understanding the vast list of IoT services and solutions which have often proved tricky to grasp. Instead of listing a portfolio of products and services, let me tell you the story of how Contoso HVAC’s journey to introduce Azure IoT with a different perspective transformed its business. Contoso HVAC manufactures HVAC Chillers, the big industrial ones used in large buildings and enterprises. The company has been manufacturing HVAC Chillers for 50 years. In recent times, to stay competitive the company is going through a digital transformation, expanding their support agreements to become remote operations and maintenance agreements. Customers of Contoso HVAC will no longer just buy an HVAC system, but instead will buy a fully managed “HVAC-as-a-Service” solution. To achieve this digital transformation, Contoso HVAC Manufacturing has to be able to closely monitor the health of its physical assets and spaces, implement predictive and proactive maintenance and grow their ecosystem through the monetization of device data and algorithms. Contoso will leverage Microsoft IoT technologies to capture data to monitor the operations and the health of the HVAC assets. This will enable Contoso to gain a deep understanding of how their design decisions affect operations, build deep expertise in maintaining large fleets of assets, and enable “HVAC-as-a-Service” where customers are relieved of the maintenance burden. As for all journeys, everyone in the caravan has to be on-boarded to arrive and be successful. That’s why we are looking at this story from the perspectives of an executive, the developers implementing the parts of an IoT solution, and all the way to the operators and employees of the company. 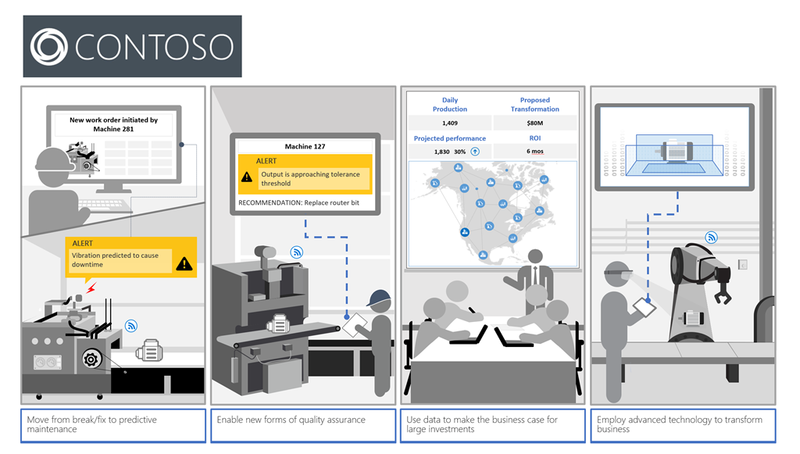 As an executive in a company like Contoso HVAC Manufacturing, you can learn about Azure IoT Suite and the value of remote monitoring, predictive maintenance, and connected factory pre-configured solutions at http://www.internetofyourthings.com. An Azure IoT Suite Preconfigured Solution is an open source implementation of a common IoT solution pattern that you can deploy to Azure using your subscription. Each preconfigured solution combines custom code and Azure services to implement a specific IoT scenario or scenarios. In under 5 minutes, you can easily deploy a preconfigured solution and evaluate the capabilities of the Azure IoT platform. Model Contoso’s devices through simulated devices. Connect physical devices to the solution. Integrate this solution and managed assets into existing business processes through apps such as Dynamics 365. Developers at Contoso, will be able to take the high-level business requirements passed on by their executives and start customizing the Remote Monitoring Preconfigured Solution modeling it against Contoso’s assets and processes. Using the Azure IoT Device Simulation tool, they can model and test the IoT solution before even connecting a real asset. Then they’ll connect a physical device to the solution to evaluate advanced features such as firmware updates. They will also connect the remote monitoring solution to Contoso’s ERP system and integrate the IoT solution to enable scenarios such as chillers automatically creating work orders when maintenance is required. As part of their customization of the IoT solution, Contoso HVAC wants to integrate maintenance operations and fleet management. Azure Location Based Services which offer maps, search, routing, and traffic capabilities with geospatial services APIs that integrate seamlessly with other Azure tools and services. After evaluating the services and developing a proof of concept, Contoso HVAC has to look into how they will go to production and scale their solution. This includes simulating device loads, identifying the right hardware for their needs in the Azure IoT Device Catalog, connecting custom devices with open source SDKs, securing the IoT solution end to end, and automating provisioning of devices that leverage the Device Provisioning Service. The Azure IoT Device Catalog is a great starting point to find devices that will seamlessly connect to Azure IoT Hub. Over 900 devices have been certified for Azure IoT connectivity but this list is only a starting point as the open source Azure IoT SDKs support a wide range of languages (C, Java, .NET, Node.js, and Python) and can be ported to a large spectrum of devices from very constrained microcontrollers or devices powered by Real Time Operating Systems such as FreeRTOS, to very powerful gateways. One of the most exciting parts of the Azure IoT SDKs is that they have all the security best practices baked in. Security practices that not only rely on a decades worth of experience building enterprise software and running some of the largest online services in the world, but are also on latest Hardware Secure Modules technologies like TPM and DICE to encrypt communications and secure data at the edge. Contoso HVAC Manufacturing can count on the Security Program for Azure IoT to work with a partner that can bring a curated set of best in class security auditors to perform a security audit on their IoT solutions and provide recommendations. As their business will grow, Contoso HVAC has to tackle the tedious problem of provisioning devices in the field. With the IoT Hub Device Provisioning Service they can go through a very simple enrollment process for the devices on the assembly line and have them provisioned with a zero-touch, just-in-time process to the right IoT hub without requiring human intervention once they are deployed to the operating locations. When Contoso HVAC Manufacturing starts deploying their new “HVAC-as-a-service” offer, they will have to deliver on the promise of a minimum downtime and fast resolution service. With all their deployed HVAC systems now connected and sending telemetry data up to the cloud, they can benefit from the power of the loud for advanced analytics, predictive anomaly detection, and maintenance workflows optimization. But there are situations when they will have to investigate issues manually to not only fix the issues but also train their systems for better prediction analysis in the future. As you can imagine, we are talking about a lot of data points and diagnosing issues could prove very time consuming. With Time Series Insight, Contoso HVAC Manufacturing can benefit from fully managed analytics, storage, and visualization service for managing IoT-scale time series data in the cloud, streamlining the process of discovering insights and doing root cause analysis. Allowing them to minimize downtime of their systems and send the right personnel and equipment in a timely manner when required. In addition to delivering their new “HVAC-as-a-service” solution and because of the expected business growth, Contoso HVAC wants to apply IoT optimizations and enhancements to their own factory to optimize chillers production. Just a few years ago, the company invested in the adoption of a very popular technology in the manufacturing industry known as OPC-UA. They obviously don’t want to replace their existing systems, but instead they want to augment them leveraging the intelligence and unlimited resources of the cloud. Trying out the Azure IoT Suite Connected Factory Preconfigured Solution, they realized that they can very easily hook up their OPC-UA infrastructure to Azure IoT not only to collect data from their factory’s sensors, but also to monitor and control the full production and assembly lines right from their IoT application. Furthermore, they realized that they could leverage Azure IoT Edge to bring part of this cloud intelligence at the Edge, right next to the factory machines to optimize on bandwidth usage and reduce communication latencies for critical systems. Contoso has a division of their business that manufactures refrigerated vending machines. The Contoso vending business will also transform into a “vending-as-a-service” model where they can provide high value monitoring and maintenance services for their customers reducing downtime and saving losses, especially for perishable goods. Today, customers call Contoso when vending machines become unhealthy so the entire contents of the refrigerated vending machine needs to be discarded resulting in major losses. Unlike the Contoso HVAC division, Contoso Vending doesn’t have the skills or resources to build a custom IoT solution. Hiring the expertise was also not an option as it was outside their core business. By using Microsoft’s IoT Central solution, Contoso Vending can build and configure an IoT solution to manage and maintain vending machines though a SaaS configuration experience. Creating a new growth revenue stream and increasing customer satisfaction at a controlled and limited cost. This is not the end of the journey for Contoso HVAC Manufacturing as they will continue growing, bringing their business together in new insightful ways. From increasing process efficiencies to delivering better customer experiences and generating new revenue streams. You can learn about other customers who chose to embark Microsoft IoT with them in their digital transformation journey visiting the Microsoft Internet of Things site.